There are 44 Assisted Living Facilities in the Smyrna area, with 4 in Smyrna and 40 nearby. The average cost of assisted living in Smyrna is $3,415 per month. This is higher than the national median of $3,346. Cheaper nearby regions include Murfreesboro with an average starting cost of $3,402. To help you with your search, browse the 253 reviews below for assisted living facilities in Smyrna. On average, consumers rate assisted living in Smyrna 3.5 out of 5 stars. Better rated regions include Murfreesboro with an average rating of 4.0 out of 5 stars. Located to the southeast of Nashville, Smyrna is one of the top 10 places to retire in Tennessee in 2019 due to its historical sites and family-friendly atmosphere. Approximately 50,000 people call Smyrna home – 10 percent of whom are age 65 and older. To accommodate those seniors, there are four assisted living facilities in the city and 40 nearby. In Smyrna and the rest of Tennessee, these facilities are called assisted care living facilities or residential homes for the aged. The main difference between the two is residential homes must have four or more. Both types are regulated by the Tennessee Department of Health. The cost of living in Smyrna is 107.2, which is higher than the state average of 96 and higher than the national average of 100. Seniors on a fixed income may find it difficult to stay within a budget when paying for assisted living. Smyrna is safer than 15 percent of all U.S. cities, which is ideal for seniors who enjoy getting outside and exploring. People in Smyrna have a one in 32 chance of becoming a victim of any type of crime. The Smyrna area is home to world-class medical facilities, including the TriStar StoneCrest Medical Center, in the event of medical emergencies or illness. Public transportation is available for seniors through the Greater Nashville Regional Council. Rides are available at discounted fares and must be requested 24-hours in advance for local travel and 72-hours in advance for out-of-county trips. Like most southern U.S. cities, Smyrna has hot and humid summers and cold winters. Average July highs are around 89 degrees, while winter lows are around 26. The area also gets around 53 inches of rain, which is more than the national average of 39. There are still approximately 211 sunny days throughout the year, which is ideal for seniors who like being outdoors. Smyrna has an array of community resources for seniors, including Opportunities for Seniors, an organization that promotes the welfare of seniors in the area, as well as one senior center. Assisted Living costs in Smyrna start around $3,415 per month on average, while the nationwide average cost of assisted living is $4,000 per month, according to the latest figures from Genworth’s Cost of Care Survey. For seniors who need help for paying for an assisted care living facility in Smyrna, the state offers two Medicaid waivers. 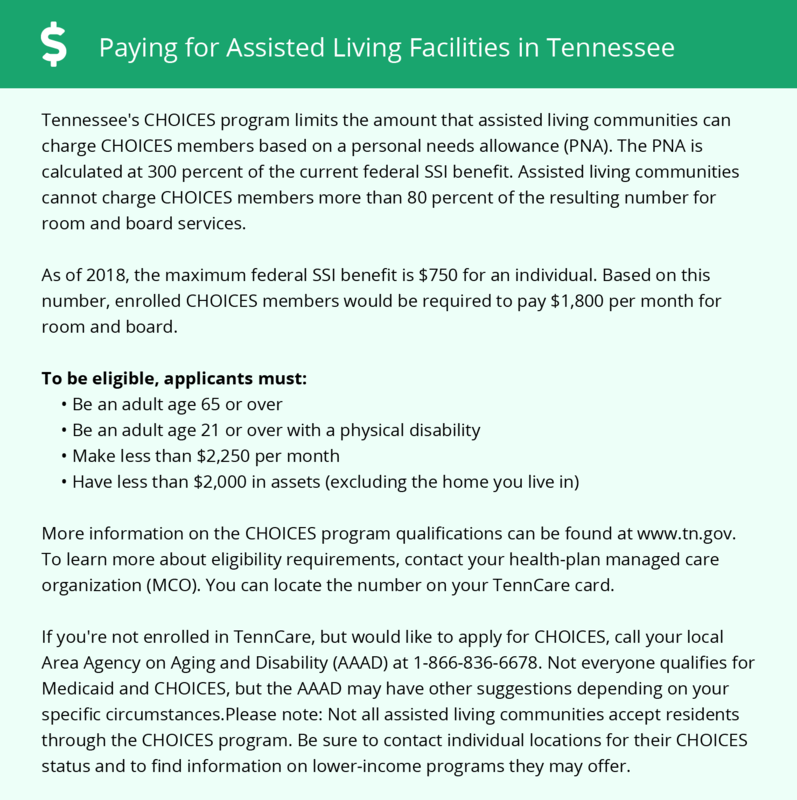 The Tennessee CHOICES program is for seniors age 65 and older who need help paying for nursing facility services. The Long-Term Services and Supports waiver helps pay for medical and personal care and supportive services. To see a list of free assisted living resources in Smyrna, please visit our Assisted Living in Tennessee page. Smyrna-area assisted living communities must adhere to the comprehensive set of state laws and regulations that all assisted living communities in Tennessee are required to follow. Visit our Assisted Living in Tennessee page for more information about these laws.